we salute those who serve! 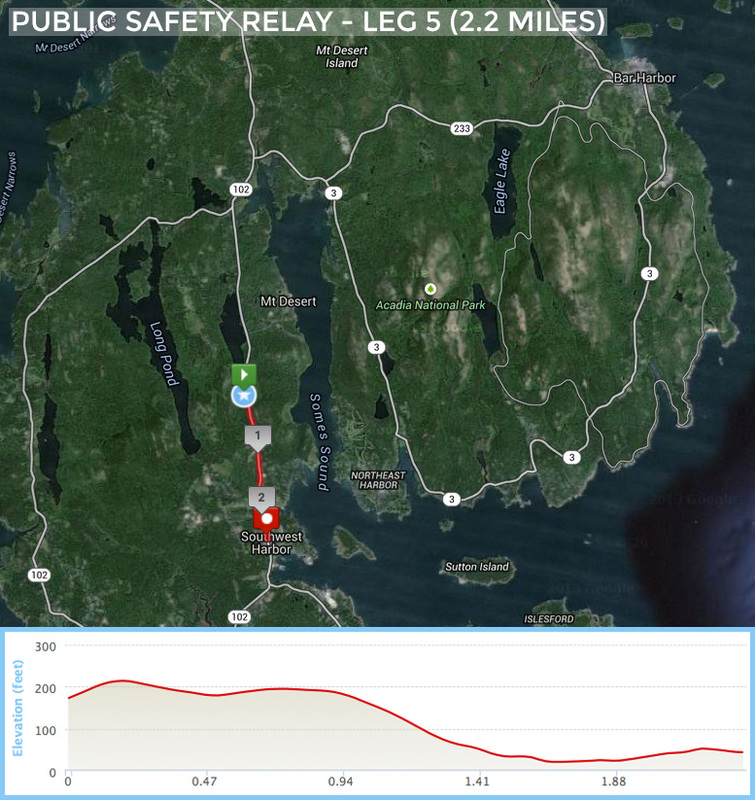 Since 2008 the Mount Desert Island Marathon has been proud to host the Public Safety Relay for recognized departments, featuring teams consisting of five members. This friendly competition is loosely patterned after the popular tradition of NYPD and NYFD members who annually run in the New York City Marathon with bragging rights going to the winning department! Registration is open! Click HERE to sign up today! How far is each leg? The first four legs are each 6-miles in length. The final fifth leg is 2.2-miles. Hand-offs are at miles 6, 12, 18, and 24. Course maps are below. How do I register my team? Your Team Captain will contact the race committee to obtain a registration code. They will then complete the registration process and name your team. This step secures your team's spot in the team division. How do I register myself? The remaining team members will register to run by choosing "Join and Existing Team" and selecting their team name from the drop-down menu on the registration page. They will enter their personal information and pay their individual entry fee. Entry fees are waived for Public Safety Relay Teams. In lieu of entry fees we encourage individual departments to launch fundraising campaigns around their team's participation in support of the Maine Special Olympics thru our Beyond the Finish Line Charity Fundraising Program. Registration for the Public Safety Relay is limited and may close before the published registration deadline without notice. The race committee recommends signing up well in advance if you are training and planning to participate. There is no early start time option for the Public Safety Relay. If you are walking the Public Safety Relay please self-seed yourself in the starting field so that faster runners are in front of you. We ask that you do this to help avoid collisions between participants in this congested area. Please note: There is no Early Start available; all teams will start at 8:00AM. All Public Safety Relay participants will be assign personalized ORANGE bib numbers. In the event that a teammate is fundraising for charity through our CrowdRise platform, they will be assigned PURPLE bib numbers. Personal transportation is required in order to participate in the Public Safety Relay. It is the individual team's responsibility to have their runners in place at the appropriate hand-off zones. Teams must display the official "Public Safety Relay" vehicle pass on their dashboard at all times during the race. This credential will be issued to your team captain at the Pre-Race Expo. Only two designated vehicles per team shall be permitted. Bar Harbor (Start) - All parking options in downtown Bar Harbor are an easy walk to the starting line, located at 200 Main Street. Posted parking hours in Bar Harbor are not enforced after Columbus Day. See PDF linked above. Exchange Zones - Please park as directed in your driving directions. See PDF linked above. Southwest Harbor (Finish) - There is NO PARKING at the finish line or on Main Street in downtown Southwest Harbor. The nearest parking to the finish line is located at the Seal Cove Road Shops as you enter Southwest Harbor on Rt. 102. It is an easy 10-minute walk to the finish line. See PDF linked above. Note: There is no formal awards ceremony. Teams may claim their awards as their team division is filled. It is the competitor’s responsibility to check posted results and claim their awards near the finishing area before they leave. Awards will not be mailed. Route 3 then gives back a downhill sweep from miles three to six in the village of Otter Creek, where runners meet the sea and those famous ragged cliffs & headlands at the southeast tip of the Island. (The first Public Safety Relay [PSR] hand-off is at Mile 6.) The small hill from mile six to seven will not be noticeable because runners will enjoy spectacular scenery along the Hunters Beach Trail. There is a long, gradual downhill from mile seven to mile nine, then a series of rolling, curving vistas which overlook Seal Harbor, and the Cranberry Isles. At mile 10 rolling hills reveal unparalleled scenes, and the village of Northeast Harbor is visible across the ocean. (The second PSR hand-off is at Mile 12.) Runners will enter Northeast Harbor, one of six villages along the course --quaint and attractive all-- and reach the halfway mark just beyond the town. If a relay runner is not in place at the time an incoming team member approaches the exchange point, the incoming runner must stop and wait until their next runner arrives. Your team vehicle should park at the Seal Cove Shops at the intersection of Seal Cove Road and Route 102. (See PDF linked above.) The first runners should join their final runner at this intersection and run the final 700 yards of the marathon route together. Be sure that the final runner crosses the finish line first for fair and accurate timing. All team members must be present to collect their finisher medals.